Every Wedding is unique and special, it sets the baseline for the rest of your lives together. We know brides (and grooms!) love exploring every detail of their big day - it is, afterall, the one chance to share with all those you love, who you are as a couple and where you are going in your new life together. 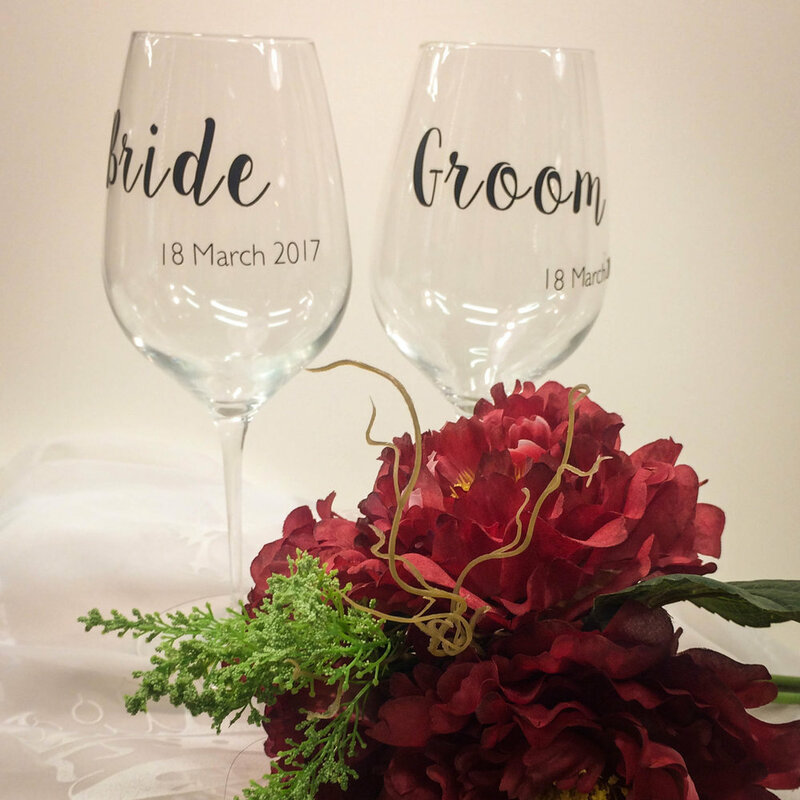 We LOVE working with couples to create unique items for their big day - we do that through personalisation and customisation. And we do it well. 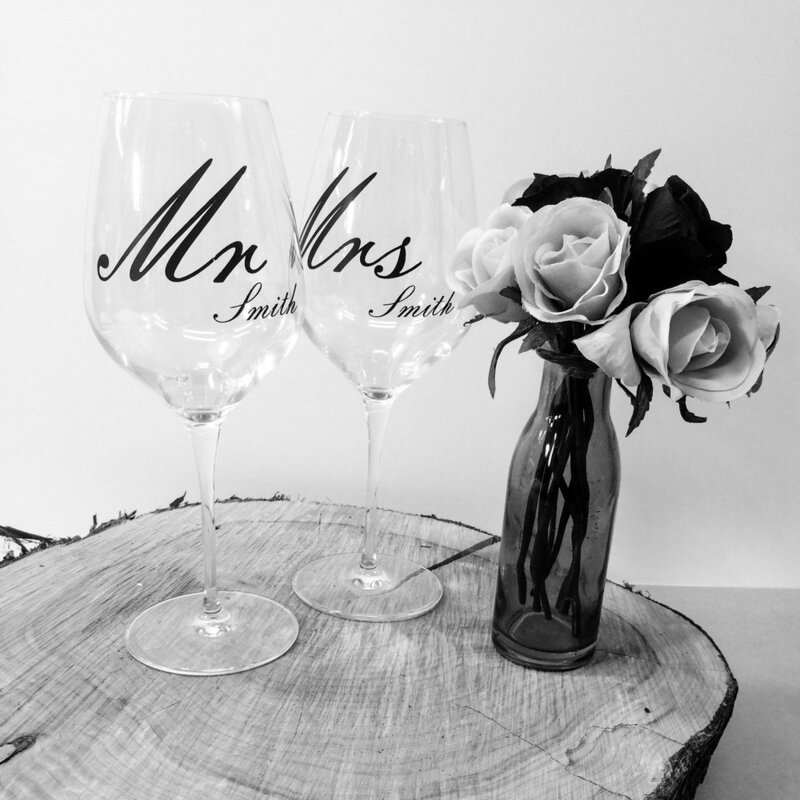 Wine Glasses are our staple, they were our introduction into the world of Weddings and they make the perfect Gift. We have sourced the most beautiful wine glasses we could; Italian made, sleek, elegant & most importantly - beautiful to drink out of. Whether it be Red, White or Bubbles which is the tipple of choice ... we have the perfect glass. The boys aren't to be forgotten either - two styles of shot glasses will keep them entertained. We can offer other glasses upon request or you can bring your own and we will customise them for you. Coat Hangers are not only make a great prop for photos (your photographer will love you! ), but customised, they make fabulous gifts or keepsakes for your Bridesmaids. Pair them with a dressing gown and your girls will be looking stylish and the tone will be set for the rest of the day. Your Table numbers are a great way to stand out from the crowd. They can be fully customised to your needs and pull together you whole table arrangement. They people to their seats easily, but you also want them to look good. Made to order, you need this wee gems in your life! A chance to do something personal - a hidden message on the bottom of your Wedding shoes! Such a nice touch, a perfect way to capture the essence of the day. One of the most popular options, selecting your own glass allows for a perfectly tailored gift. Do you have the perfect glass, but want to make it unique? We can create custom decals to suit your occasion and need. Whether it be glasses for the Boys' stag do or the Girls' Hens party, or glasses for the parents of the Bride or Groom. One-off is what we do best. The sky really is the limit. We are open to any ideas that you may have and we will definitely try and give them a go. We are constantly introducing new products to our Wedding range. Sign up with your email address to receive news and updates. Come and see all these amazing products in real life. We are always looking to increase our range of Wedding products, if you have any great ideas that you are looking to source locally, get in touch with us - we would love to help!